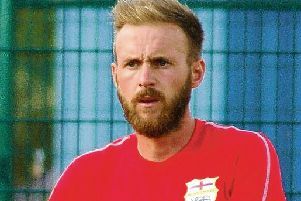 Holwell Sports manager Neil Miller insists his team is looking upwards rather than over their shoulders following Saturday’s crucial win over Raunds. 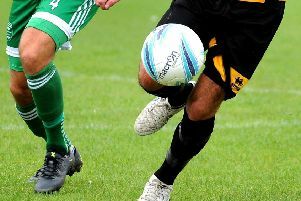 The 2-1 comeback victory lifted Holwell three points clear of third-bottom Huntingdon in United Counties League Division One, and five points clear of Saturday’s opponents, with a game on hand, as the threatened teams begin their run-in. “A point would have been okay, and a defeat wouldn’t have been disastrous,” said Miller. “But it would have made it really tricky; the mountain becomes pretty big if we lose. “When we got beat by Burton Park and Raunds beat Anstey on the same day, that was the toughest week to take. That made everyone a bit twitchy. Sports have a potentially tricky final seven games, with five of them against teams currently sitting in the top eight, including a home game with title-chasing neighbours Melton in their penultimate fixture. They will also go into Saturday’s trip to Irchester without the injured Tom Harris and Michael Stevenson, and the suspended Luke Peberdy. Yet the Holwell boss has only one way of looking at a challenge. “It leaves us a little bit light, but spirited,” Miller added. “Ben Betteridge has come back and been superb for the last few games, the partnership at the back between Ross Dunlop and Ian Bitmead is really developing, and Mike Hendey has added that bit of flair in the middle. “We have seven cup finals, and I think seven points from those games will see us clear, but I want seven wins. “I’m not sure how realistic that is, but every team in this league has its weaknesses and we go into every game looking at how to exploit them. Miller took over in October after Andy Gray’s resignation, with a short-term mission to keep Holwell in the United Counties League beyond their maiden season. Difficulties in building squad depth, combined with a resurgence of teams battling the drop, have seen Holwell unable to pull clear from potential trouble, picking up six wins and three draws from his 22 matches at the helm. Yet the former Cottesmore Amateurs boss has already begun to draw up a list of player targets for next season and knows that securing UCL status is key to that recruitment. “We knew the situation when coming in,” he explained. “We knew we were going to struggle to bring in as many players as we needed to give our squad strength in depth. “We have done okay, but we are still not where we want to be. He added: “The goal is still the same. This is a survival season and that builds characters. “We have brought in players who haven’t played UCL football and they have benefitted from this more than being in a mid-table team.